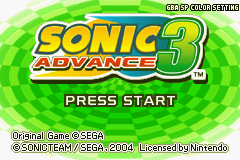 Back to: Sonic Advance 3. Pressing on the title screen will rotate between palettes tailored for the Game Boy Advance, Game Boy Advance SP and the Nintendo GameCube's Game Boy Player. This feature is mentioned in manualsMedia:SonicAdvance3 GBA US manual.pdfMedia:SonicAdvance3 GBA UK manual.pdf, but is not explained. Curiously despite having a backlit screen, the Game Boy Advance SP option uses the lightest palette. Complete all 7 Special Stages, then, on the main menu, press . 0000E830 000A + 100B9B14 0007 Enable Code (Must Be On). A30015DC 0000 + 8300160C 000F Invincible (Only When Moving). A30015DC 0000 + 8300161C 000F Always Have Speed Shoes. D0000020 0004 + 330015C7 0003 Hold Select To Pass Through Certain Objects. 730015DE 0200 + 830015C6 0001 + 730015DE 0100 + 830015C6 0000 Press For Reverse Gravity/Press For Normal Gravity. 330015CC 00?? Button Power Modifier (00: Normal Slide, 1F: Hammer, 29: Power Slide). 330015CD 00?? Jump Power Modifier (00: Normal, 0F: Boost Jump). 330015E8 00?? 1st Character Modifier (00: Sonic, 01: Cream, 02: Tails, 03: Knuckles, 04: Amy). 33001734 00?? 2nd Character Modifier (00: Sonic, 01: Cream, 02: Tails, 03: Knuckles, 04: Amy). 33001708 00D5 + 730018D4 000A + 830018D4 00D5 Tails Never Gets Tired When Flying. 33001704 00D5 Cream Never Gets Tired When Flying. 33000540 001F Enable All Characters. 83000558 7F09 All Levels Open. 83000562 FFFF Have All Chaos Emeralds. 43000552 0909 + 00000004 0002 Have All 9 Keys. 83004120 000B Unlock Special Stage Mode. 43004866 0000 + 00000007 08EC Always Get A Chaos Emerald. 43000544 03FF + 00000007 0002 Have All Choas Found. 83000562 047F Have All Chaos Emeralds. D0000020 0001 + 830015DA FB00 Mega Jump. This page was last edited on 5 April 2019, at 13:32.